When it rains, it pours … and this amateur sleuth may be in over her head. Graduate student Raina Sun is trying to keep her head above water as the bills roll in when her dashing college adviser cons her out of several months of rent. Her quest to retrieve the money sets in motion a streak of even worse luck. First, she stumbles on her advisor's dead body and becomes a suspect in his murder. Next, the only man she's ever loved reappears as the lead detective to the case. Raina's having trouble interpreting his signals--does he want to reignite their passion, or just stay close to his prime suspect? Her life careens further out of control when her grandma shows up at Raina's postage-stamp-sized apartment, dragging a red suitcase and trouble of her own. As Raina summons her sleuthing skills, she discovers that when it comes to murder, there may be no place for an amateur. For readers who like cozy mysteries, quirky characters, and a dash of humor. 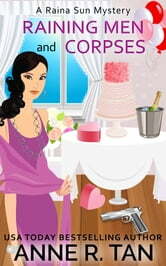 Come on in, the water's fine--get your copy of Raining Men and Corpses today! Really fun book, surprise ending. Po Po is awesome and Rainy it is too much. Good book! 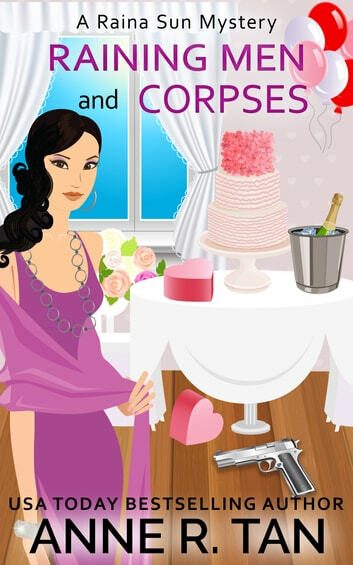 Nice mix of murder, mystery, romance and comedy. I am ready for more of Rainy and Po Po. Looking for a new cozy mystery? Hoping to find something entertaining? Something light yet with some intrigue? Than I would say give this one a try. Enjoyable, easy read. Likeable characters and a fast enough pace to keep you interest. Perfect for those weekend when you want to relax or those evening where you want to immerse yourself in something fun. I liked this book although sometimes I found myself a bit lost. I may read other stories by the same author. It was a good read and the story line was ok. I hope Rainie ends up with Michael. She deserves happiness, like we all do.